Homemade coconut yoghurt - rhubarb edition - NOURISH TO PERFORM. Who doesn’t like creamy and thick yoghurt? I’ve been quite a greek yoghurt and curd addict my whole life and quitting dairy and eating paleo based made me miss this part of my late night snack. A even more tasty alternative, I fell in love immediately, is coconut yoghurt. As it is quite expensive and I love to experiment in the kitchen and have as much homemade foods as I can, I decided to make my own. And because I’m so addicted to it, I not only share a basic recipe but also a sweet, fruity and sour dessert version. I love how easy this yoghurt maker is to use. You don’t need any power and it has never disappointed me – it really makes a good yoghurt. It doesn’t matter whether you want to make normal yoghurt or plant based one, this one is the one to go for, in my opinion! I can also recommend this starter cultures which have been working perfectly fine, as well. I’m quite satisfied with the basic recipe but I’m still working on some improvements. Nevertheless, I decided to share it with you as so many have been asking me for a recipe. 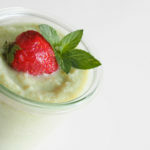 If you don’t want plain yoghurt try my fruity rhubarb mousse – it is heavenly! I seriously love the sour taste of rhubarb. 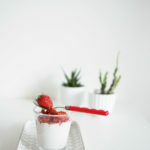 So I decided to combine my rich and thick coconut yoghurt with sour rhubarb, a hint of stevia for the sweetness and a lot of vanilla and voila – I had the most refreshing and energizing, yet sweet, dessert! Also, I’m using raw rhubarb in this recipe and NO it is not harmful, eating raw rhubarb is totally fine and is even better because you preserve all the vitamins and micro nutrients! Bring coconut milk with agar agar to a boil and cook for two minutes./Die Kokosmilch mit Agar Agar aufkochen und 2 Minuten köcheln lassen. Mix 100ml almond milk with probiotic powder./Das probiotische Pulver mit 100ml Mandelmilch anrühren. 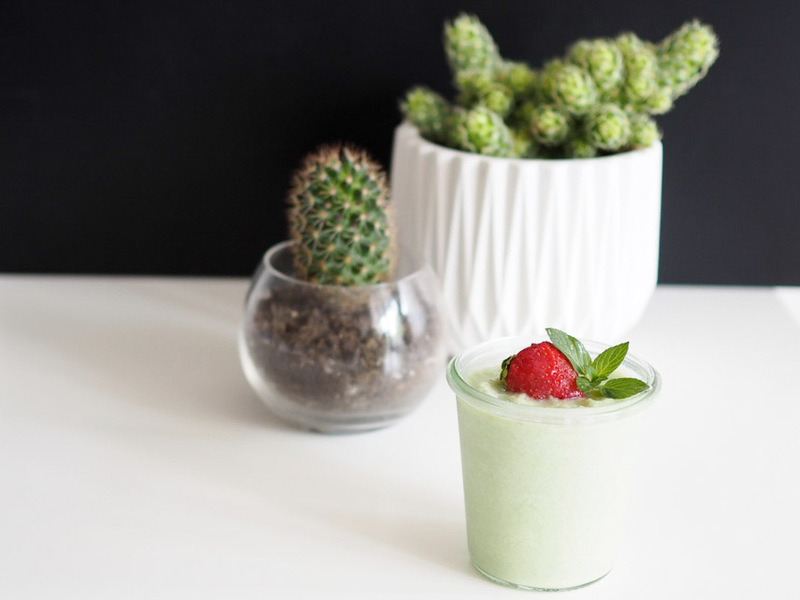 Fill almond milk and lukewarm coconut milk with agar agar in the bowl of the yoghurt maker and add the probiotic-almond milk-mix./Die restliche Mandelmilch, die Kokosmilch mit Agar Agar (sollte lauwarm sein) in die Schale des Joghurt-Makers füllen. Fill yoghurt-maker with boiled water and put the bowl in./Den Yoghurt-Maker mit abgekochtem Wasser füllen und die Schüssel hineingeben. Let sit for about 14 hours and put in the fridge afterwards./Für 14 Stunden stehen lassen und das Joghurt dann in den Kühlschrank geben. Put away 100ml of your yoghurt to use it instead of probiotic powder when making yoghurt the next time. This works for about three times. Then you have to use new cultures./100ml des Joghurts abnehmen und statt des Probiotikpulvers in die Mandelmilch einrühren. Bei mir funktioniert das Überimpfen dreimal, dann brauche ich wieder neues Pulver als Starterkulturen. Put all ingredients in a food processor and blend until smooth./Alle Zutaten in eine Küchenmaschine geben und zu einer cremigen Masse verrühren. Put in a jar in the fridge for about 3 hours before enjoying it./In einem Glas für etwa 3 Stunden in den Kühlschrank stellen und dann genießen.